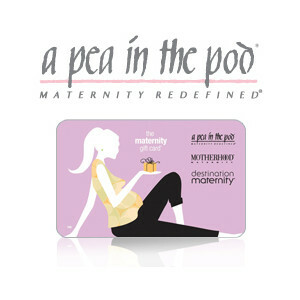 A Pea In The Pod Maternity gift card makes the perfect present for any mom-to-be! This store offers so much for the expecting mom-to-be. Shopping can be so much fun. Choose from dresses, jeans, leggings, pants, tops, jackets and coats, skirts, shorts, swimwear, active and loungewear. Affordable prices and top trends for the pregnant woman. Search for their new arrivals. Check out their style guide if you are not sure what is in. What is comfortable to wear to work or on that exciting babymoon you are planning to take. Getting closer to the delivery date don’t forget to pack that hospital bag. Purchase the perfect items to take along. Baby Shower dresses and more. If you buying a gift for someone choosing a gift card may be an easy idea. And, they may be redeemed at A Pea In The Pod, Destination Maternity, and Motherhood Maternity stores, and their online stores. FREE standard shipping on all gift cards. The delivery time frame is 3-7 business days. To redeem a gift card when shopping just provide the card’s 16-digit number code on the billing page of the checkout process. You can also check your balance.